Economy - overview: Mexico has a free market economy with a mixture of modern and outmoded industry and agriculture, increasingly dominated by the private sector. The number of state-owned enterprises in Mexico has fallen from more than 1,000 in 1982 to fewer than 200 in 2000. The ZEDILLO administration privatized and expanded competition in seaports, railroads, telecommunications, electricity, natural gas distribution, and airports. A strong export sector helped to cushion the economy's decline in 1995 and led the recovery in 1996-2000. Private consumption became the leading driver of growth in 2000, accompanied by increased employment and higher real wages. Mexico still needs to overcome many structural problems as it strives to modernize its economy and raise living standards. Income distribution is very unequal, with the top 20% of income earners accounting for 55% of income. Trade with the US and Canada has tripled since NAFTA was implemented in 1994. 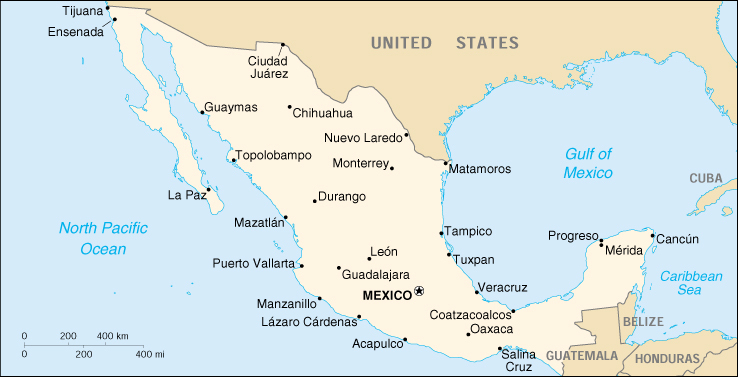 Mexico completed free trade agreements with the EU, Israel, El Salvador, Honduras, and Guatemala in 2000, and is pursuing additional trade agreements with countries in Latin America and Asia to lessen its dependence on the US.